In 1859, Harmon Henkle moved from Richmond, Washington County, Iowa to Fillmore Township in Iowa County, just north of a settlement on a high plain near the English River. He farmed for two years at that site, then traded his farm for a saw mill built by Patrick W. Rock in the settlement. That was the beginning of a career of lumber and merchandizing interests that would help build the success of several towns in Iowa and even one in Idaho. The following is taken from Biographical and Genealogical History of Keokuk County, Iowa, 1903. "The fitting reward of a well spent life is retirement from labor and a period of rest in which to enjoy the fruits of former toil. This has been vouchsafed to Mr. Henkle, who is now living in Keota - a town in which he has been a very important factor as a promoter of many lines of progress and improvement contributing to the general good." "He was born in Fayette County, Ohio, April 7, 1832, and is a son of George W. Henkle. The grandfather also bore the name of George Henkle. The former, a native of Virginia, was a farmer by occupation and come westward to Iowa in 1840, settled in Washington County, where he entered upon land from the government and improved a farm, making his home thereon for many years. He died, however, in Keokuk County, Iowa, at the advanced age of eighty-three years. His political support was given to the Whig party until its dissolution, when he joined the ranks of the Republican Party, which was then formed, and marched under its banners throughout his remaining days. He was honored by his fellow townsman with a number of local offices and was a consistent member of the Episcopal Church. His wife, who bore the maiden name of Polly Bush, died in Washington County, Iowa, when the subject of this review was about sixteen years of age." "Harmon Henkle was the second child in his father's family and was eight years of age when he came with them to Iowa. He was reared and educated in Washington County, pursuing his studies in a log schoolhouse there such as was common at the that time. After arriving at the age of maturity he was married in Washington County in 1854 to Lydia J. Wartenbee, a native of Ohio, who came in early girlhood to Iowa. To this marriage were born five children: three of whom are living: Ella, now the of E. M. Ritchey, of Keota; Watson D., who married Emma Hunter and is a farmer of Van Buren County; and Clara, the wife of E.E. Bowers, a general merchant of Keota, carrying on business as a member of the firm Bowers & Sanders." "After his marriage Mr. Henkle located in Richmond, Washington County, where he followed carpentering until about 1859, when he removed to Iowa County. There he engaged in farming for two years and in the Spring of 1861 took up his abode at a place which has since been called Henkletown, trading his farm property for a saw mill there. He was then engaged in the manufacture of lumber until the close of the war (Civil War) and in the meantime he also turned his attention to general merchandizing, which he followed successfully until his removal to Keota." "In 1872 this town was laid out and Mr. Henkle became one of its first merchants, erecting the second or third building of the place. He and his partner removed their stock of goods from Henkletown and conducted a general store in Keota until 1886, and in addition carried on an extensive business under the firm name of Henkle, Littler & Company. This partnership was maintained for several years." "About 1886 our subject purchased a third interest in a steam grist mill at Keota and carried on general merchandising in connection with his milling interests, his enterprise contributing materially to the upbuilding and and substantial improvement of the town. In August, 1891, he removed his mill to Weiser, Washington County, Idaho, where he conducted business until July, 1899, when he sold his interest and returned to Keokuk County, Iowa. Mr Henkle has also been a factor in agricultural interests here, owning and operating a farm in Lafayette township, adjoining Keota." "He became interested in banking affairs here as one of the stockholders of the Keota Bank, which in 1899 was merged into the State Bank. Of this instituion he has been the vice-president for many years and its successful conduct is due in no small degree to his efforts. He has valuable property in the town and in all his business affairs has met with creditable success. His prosperity is due entirely to his own efforts and as the architect of his fortunes he has builded wisely and well." "Mr. Henkle is know as a promient and exemplary Mason, belonging to Adelphi Lodge No. 333, Free and Accepted Masons. His connection with the fraternity dates from 1863. He was treasurer of the lodge in Greene Township, Iowa County and in his life shows forth the helpful and benevolent spirit of the craft. He is also member and one of the trustees of the Baptist Church. Since the days of the Civil War he has been a staunch Republican in his political views and has held a number of local offices in this township. No man has taken a more active or helpful interest in Keota that has the subject of this review, who has wrought along the lines of the greatest good to the greatest number. His business affairs have been not only a source of revenue to himself, but have also contributed to the general prosperity , and in many ways he has aided in the progress and improvement of this section of the State. Patriotism may well be termed one of the keynotes of his character and among Keokuk County's valued citizens he deserves honorable mention." NOTE: Henkle and his partner started the first Bank in Keota in 1875, called "The State Banking House of Henkle & Littler & Company." Henkle opened lumber yards in Hinkletown, Keota and Kinross. The first public school in Keota operated in Henkle's lumberyard offices. 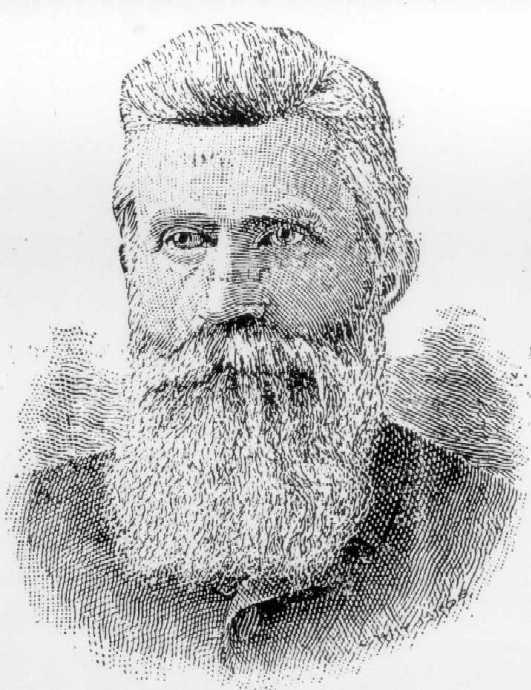 He was also a member of the school board in 1888. Henkle was a director of the Eagle Glass Works in Keota, and the Acme Butter Company that operated in Washington County, Iowa. Henkle shared his success by developing several business partners who also moved from Washington County to Hinkletown at an early time, and then on to Keota when he developed businesses there. He also had hardware, furniture and undertaking businesses in Keota and Kinross. For many years the Henkle name was connected to success, honesty and trust in several towns within Iowa and Keokuk Counties. Information from the 1903 Biographical and Genealogical History of Keokuk County, the Keota Centennial History 1873 - 1973, and the 1888 Special Edition of the Keota Eagle newspaper. If you have additional information or photographs of Harmon Henkle, please Contact Us!